Hawaiiah uses the hibiscus--the Hawai`i State flower--to create its tropical island appeal. 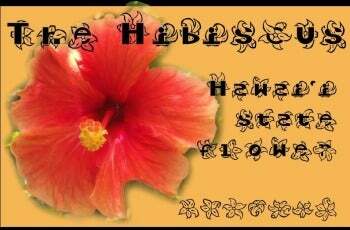 Outlines of seven different hibiscus blossoms curl and hide behind bold upper and lowercase letters of Hawaiiah (free). This TrueType font from designer Jesse Wilson (AKA Caffeen), also includes numbers, the hibiscus flowers as dingbats, and basic punctuation marks (apostrophe, colon, and semi colon sans flower; question and exclamation marks with a hibiscus). A poster or display font to use sparingly, Hawaiiah merges the easy elegance of the beautiful hibiscus shape with characters of varying line weight. This, along with non-existent ascenders, make Hawaiiah more fun than functional. Setting more than a few lines of text in this font would make it hard to get your message across. But all-round, Hawaiiah is like a walk on a beach barefoot: Sometimes it's just what you need. Free for both personal and commercial use.